Aunty Lila, Mom and Uncle Peter about a month back. Sundays were always different, especially for Mom. She went to work. Well, actually she attended cooking classes in the vicinity conducted by Aunty Lila. Mom had a natural flair for the culinary arts. With these classes she aced various cuisines, right from Continental to Chinese, East Indian to Thai, and Goan to Moghulai. And the next 8 years she helped Aunty Lila conduct them. Come to think of it, there was no formal name or classic advertising of these classes. It was simply known as Lila’s cooking classes. Pretty ingenious, eh? Aunty Lila was sunshine personified. Some of my best childhood memories are of her house parties. Great food and wine matched with perfect cutlery and glassware, and always topped with two or more mouth-watering desserts. I used to think she had a secret pair of hands that she saved for these special occasions. She made an extra effort to ensure everyone was comfortable. Our plates would always be lovingly refilled just as we would get goodie bags whilst leaving. The fine art of entertaining was something I imbibed from her. Lila D’souza was born on 22nd February, 1925. Bandra, Bombay (now Mumbai) had always been her hometown. Like every other girl, she grew older, got married and had four sons. Life happened unexpectedly when she was widowed at a young age in 1965. She devoted her time in bringing up her sons with the help of her supportive in-laws. A young bachelor, Peter Karunan, fell in love with her. That she was a mother of four, did not deter him. She however did not wish to take this alliance further. He went a step ahead and spoke to her in-laws. A lot of convincing and five years later, in 1970, they were wed. A commendable feat for the day and age, then and now. A sole earning member supporting a family of six was proving to be difficult. Four young boys had a whole lot of growing needs. That is when Lila , now Karunan, knew she had to pitch in financially. So armed with recipes from her mother’s kitchen along with her savings, she set sail. She invested in a cooking range, utensils, cutlery and stools for students to sit. 1971 saw the beginning of Lila’s cooking classes. Sundays, 2 to 4 were fixed as the class timings. A meager Rs 30/- per month was charged as fees. An additional Rs 10/- was taken every class for typewritten copies of the recipes and a sample of the cooked delicacy. Initially, she had locals who trickled in. Soon, the word spread and people, yes, men too, came from far and wide to learn. Aunty Lila, as she was fondly called, taught with the patience of a mother and the flair of a Master-chef. Over the 20 odd years that she ran the classes, Aunty Lila must have taught thousands of eager students. Tell her this and she haughtily adds, “The girls knew my Desmond was a bachelor.” Yet, right from new brides-to-be to wives looking for newer kitchen avenues, chefs in training to students with the aptitude for flavours, men who wished to floor the women with their culinary skills to partners of mixed marriages wanting to learn new cuisines, they came. Aunty Lila imparted her infinite knowledge to them all. Adorned in an apron right in her living room, her classes never had a dull moment. 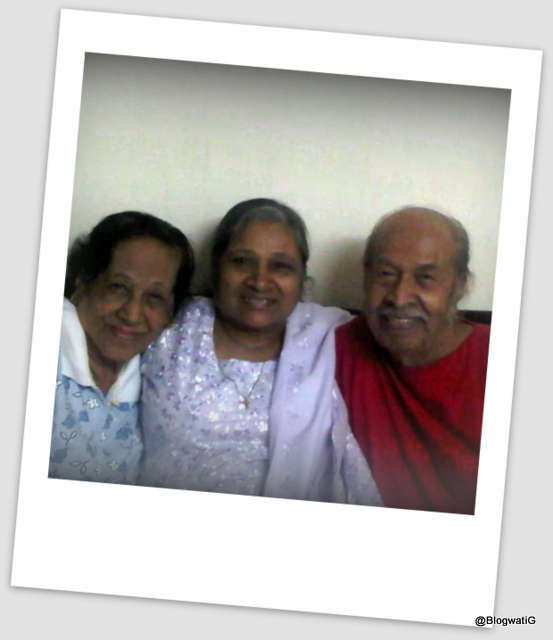 Present day, both Aunty Lila and Uncle Peter are 88. He still makes the morning tea. She still cooks their daily meals. Anyone who visits them still comes away with a packed tiffin box of goodies. She loves entertaining, even though health restricts them both. Pudding Aunty as we refer to her is the closest family we have out here. Why Pudding Aunty? That is the name my sister, her godchild, gave to her when she was 3. She simply made the best puddings in town. She still does. Guts, self-belief, passion, skill – all the makings of a great entrepreneur. Loved the story. Pudding Aunty’s story needs to be read by many. You bet! And I am crossing my fingers and toes. What an inspiring story Vinita! I thought so too Dagny. I knew I was going to write about her the moment this contest was announced. I am so glad. Yes she is truly is the sunshine to so many of us. Wow! She really is a gutsy woman and I think the women back then were more stronger mentally than what we are today. Even the simple women who stayed at home displayed more strength and grit in taking the life head on. You bet Janu. I think she was amazing for a simple homemaker. Nothing simple about that, I can assure you. Afshan, she is in the happy memories of so many people around the globe that is obvious that happiness knocks on her door often. very inspiring story, just loved reading, thanks for sharing this !! Thanks Genny. I loved penning it. Brought back many memories. So well written. You made Aunty Lila come alive in my mind and I could even smell her delicious cooking. What a strong woman she is! Good luck with that contest! I think this would be perfect for that Chicken Soup book. Good luck! Aunty Lila summarised it all herself! Behind every successful man is a woman, and vice versa. I commend Uncle Peter for being there for her through thick and thin. Oh yes. Uncle Peter is her rock. It is rare to find a man of his ideals. A really inspiring story of a lady who shows us that it is us who think that older times were not so welcoming for women. I guess it was all about who had the guts to do something!! Bang on Smita. She did not sit at home and cry her heart out. She saw a problem and came up with a solution. Whether it worked for the better was for later. She always believed in making the hours count. Yes Diana and I think we were lucky to live and learn through such wonderful examples. A woman of substance as you rightly put it. This tale is a sure hit ! I hope so too Vasudha. It would be the perfect ode to her. My girl … what do i say my girl …. 🙂 that’s what she would say …. lovely …..:) fingers crossed … let me know when is the party ill have to check tickets na 🙂 … we are gonna be in Chicken soup 🙂 ….. True that Richa. You have to see both of them to believe in love that lasts a lifetime. Oh, I’ll always remember your birthday then. I am sure you will. Each one of us has it somewhere, we just need to find it. Wow! What an amazing, inspiring and a heartwarming story! Thanks Shilpa, She is an amazing person too! Pudding Aunty sounds like an amazing woman – love the name Pudding Aunty. The name is courtesy my sister 🙂 Yup, she is amazing. Such a sweet story and a true entrepreneur!! Amazing life story. Pudding aunty certainly can be an inspiration to so many women of themselves who think nothing of the talent that they have. Pudding aunty. I can really picture everything you wrote about her. Very nice post Vinita. Good luck.